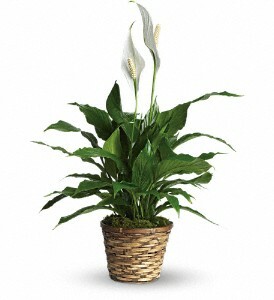 Also known as the peace lily, this dark leafy plant with its delicate white blossoms makes a simply elegant gift. There's nothing small about the sentiment delivered along with this pretty plant. A brilliant green spathiphyllum is delivered in a natural wicker basket. Long live elegance!